wanderlust ATLANTA: Let's do the Time Warp again...at Out Front Theatre! Let's do the Time Warp again...at Out Front Theatre! Launching its second season, Out Front Theatre is showcasing The Rocky Horror Show, based on the cult musical of 1975, in a way you've never seen...and it's magnificent! I saw their whole first season and was already impressed, but they knocked this one out of the park...out of the galaxy! I had the great pleasure of attending Opening Night and, by a stroke of good fortune, my friend Matty and I got seats front row center! Second and third row are optimum viewing, but I like feeling like I'm practically on stage...the energy was spellbinding! 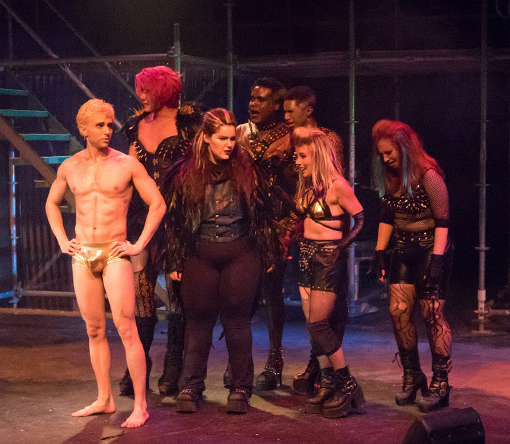 "When The Rocky Horror Show was chosen to be the first show of our season, we knew we were dealing with a performance that people can be fanatical about," says Producing Artistic Director and Founder of Out Front Theatre, Paul Conroy. "We didn't want to rehash the movie, as much as everyone loves it, and we didn't want audiences knowing what to expect when they walked through our doors. With the cast and crew we have working on this show, I can confidently say that not a single audience member will know what has hit them!" And Paul is right! THIS show, while wholly honoring the film that millions love, delivers laughter inducing surprises, gender twists, and character characteristic reversals...but don't worry. Your attention will not waiver, your eyes and ears will be filled with pleasure, and like me, I'll bet your cheeks hurt by intermission from laughing and smiling so much! The callouts from the not-virgin audience members are hilarious! I'd not experienced Rocky Horror in a cinema setting until a few years ago, which was awesome, but seeing the show performed on stage by live actors is fantastic! You may have seen in the advertisements that this show is "Complete with sass from the audience!" You too can be part of that sass! Grab a bag of props from the concessions stand...1 for $3 or 2 for $5. You'll get toilet paper, a glow stick, a playing card, and more! The audience participation adds a whole other dimension to this "deliberately kitschy rock 'n' roll sci-fi gothic musical!" Your bag has a list of when which prop is to be used and the same list is in your program. Prop away! 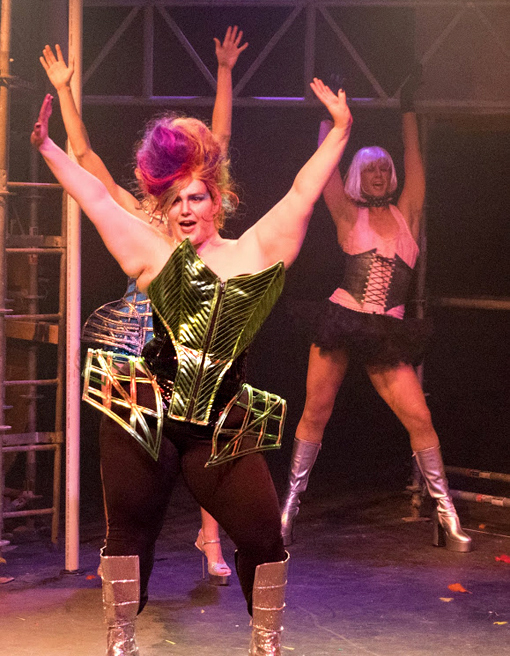 If you're already a fan of The Rocky Horror Picture Show, you're going to be floored by some of the character "modifications" in Out Front's The Rocky Horror Show. Like Paul said, you're not going to know what hit you! 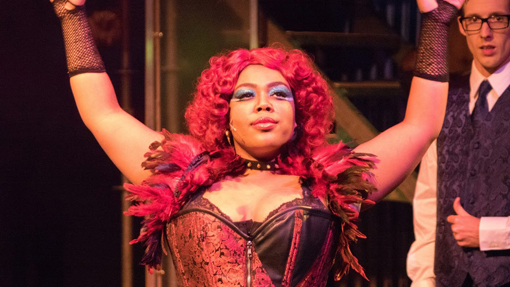 Kiona D. Reese (Frank N. Furter) is beyond phenomenal! You don't once think of Tim Curry (and Tim wasn't this pretty!) while watching Kiona's masterful performance! The audience, including me and Matty, loved her! Jacob Jones (Brad Majors) is casting perfection! I'd go as far as to say that Jacob is better as Brad than Barry Bostwick was. No disrespect to Bostwick, but it's not often an actor comes along and actually improves on such a beloved character. Jacob did! Ally Duncan (Janet Weiss) is super animated as Janet, which is a 1,000% requirement for this show. Ally delivers a wholly entertaining, totally fun performance. You're going to give yourself over to absolute pleasure enjoying her! Max Mattox (Rocky Horror) is the perfect Rocky! In every way. From a learning-to-walk newborn creature, to making a ravenous convert of Janet who changes her tune from "I don't like a man with too many muscles" to "Touch-a touch-a touch-a me...", Max has all eyes on him! Joe Arnotti (Magenta) has inexhaustible energy, a witticism that radiates and demonstrates brilliantly through face, body, and movement across the stage, not to mention one of the best high kicks I've ever seen from someone so tall, or short for that matter! Emily Duke (Columbia) is one of my favorites in this cast. She gives 1,000% (read: one thousand percent!) to her role and it comes through! There's a LOT happening on stage, but I kept following Columbia's antics and laughter-inducing facial expressions. I'm laughing again as I type! Rotating performers will read the role of "The Narrator"—the Criminal Psychologist from the movie. On Opening Night we were treated to Brigitte Bidet—"Atlanta's Best Drag Queen" - Creative Loafing. She was AMAZING! Had us all in stitches!